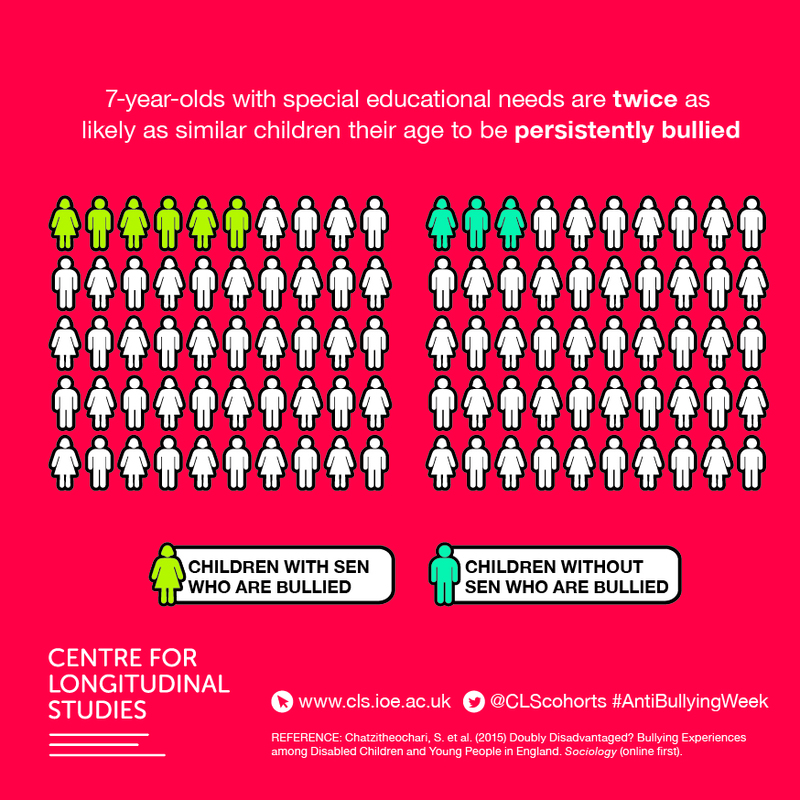 This infographic illustrates the persistence of bullying for children with special educational needs. This graphic uses data from the Millennium Cohort Study. It was produced as part of the CLS activities for 2015 Anti-Bullying Week. On 9 November 2015, CLS partnered with the Anti-Bullying Alliance to deliver a seminar for anti-bullying charities and local government workers on the long-term effects of bullying. 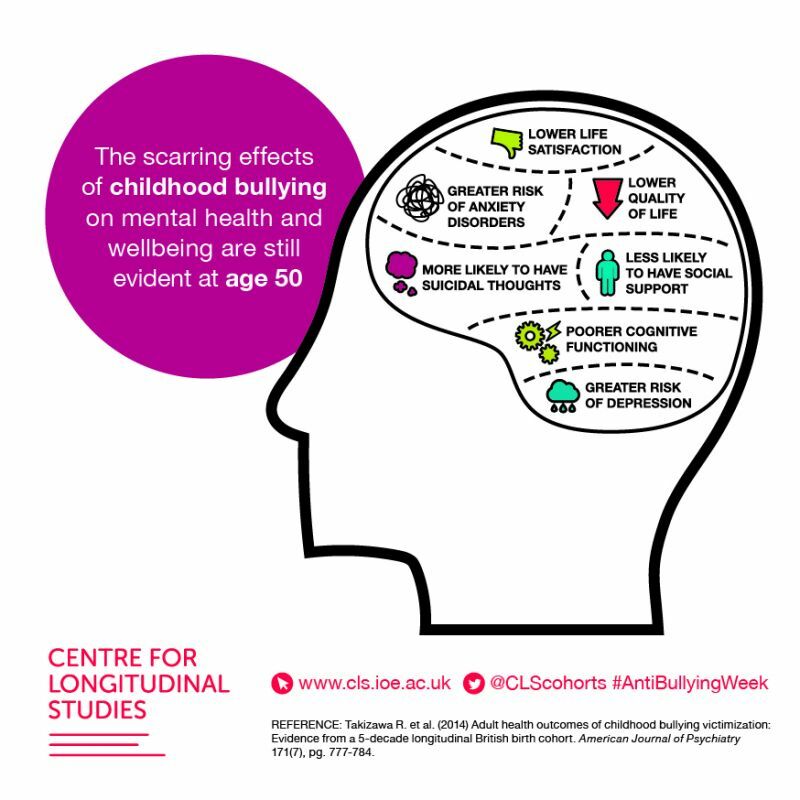 This infographic illustrates the different effects of childhood bullying on adult mental health and wellbeing. 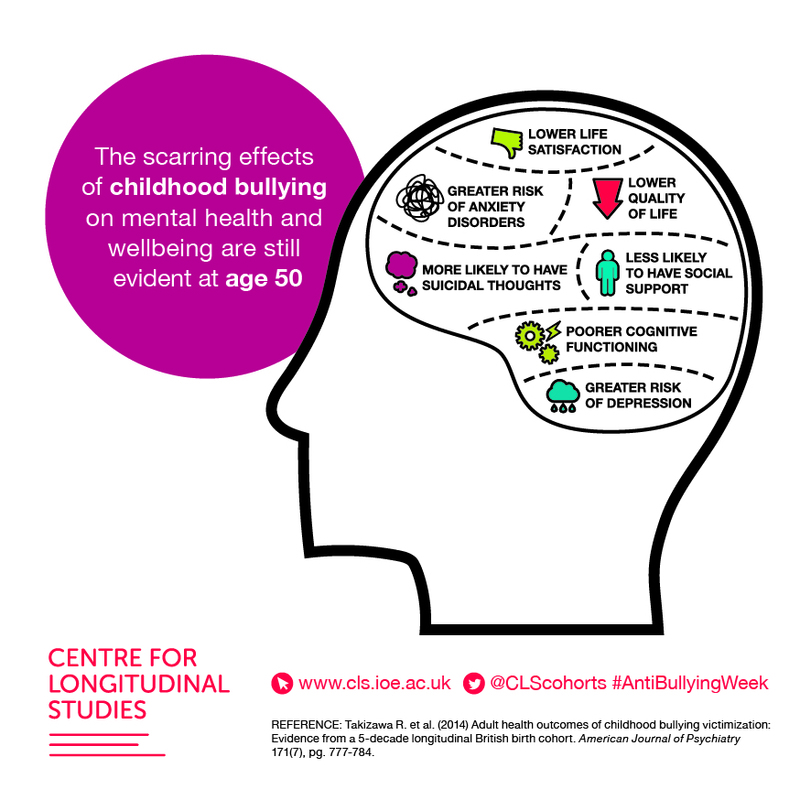 It uses data from the age 50 sweep of the 1958 National Child Development Study and was produced as part of the CLS activities for 2015 Anti-Bullying Week. On 9 November 2015, CLS partnered with the Anti-Bullying Alliance to deliver a seminar for anti-bullying charities and local government workers on the long-term effects of bullying. 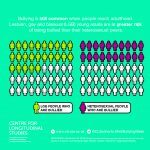 This infographic illustrates how lesbian, gay and bisexual (LGB) young adults are at a greater risk of being bullied compared to their heterosexual peers. 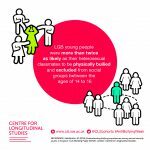 It uses data from the age 20 sweep of Next Steps (formerly known as the Longitudinal Study of Young People in England) and was produced as part of CLS’s activities for the 2015 Anti-Bullying Week. On 9 November 2015, CLS partnered with the Anti-Bullying Alliance to deliver a seminar for anti-bullying charities and local government workers on the long-term effects of bullying. 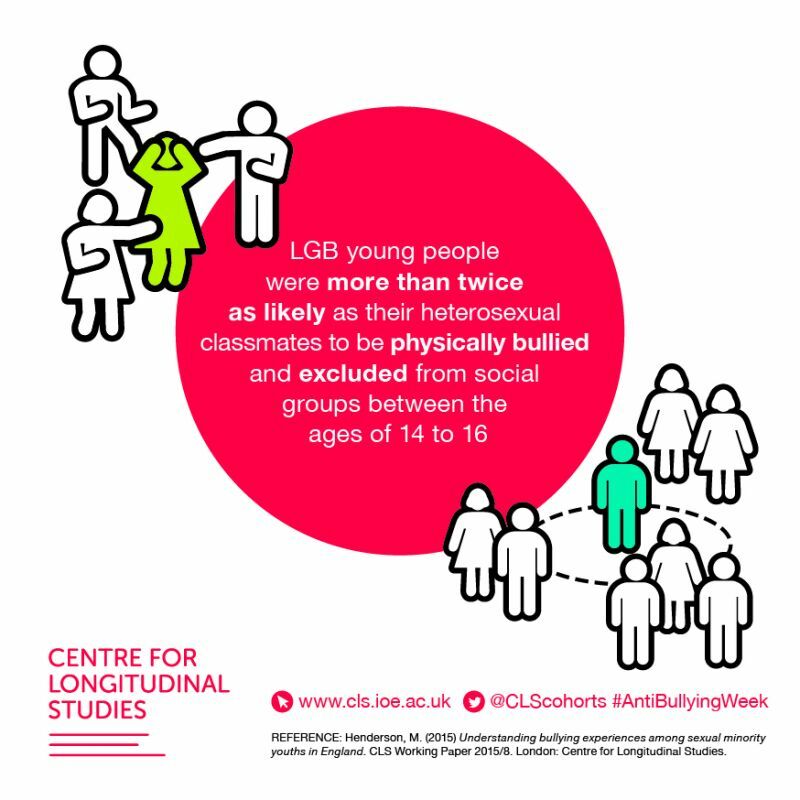 This infographic illustrates how lesbian, gay and bisexual (LGB) young adults are more likely to be physically bullied and socially excluded between the ages of 14 to 16 compared to their heterosexual peers. 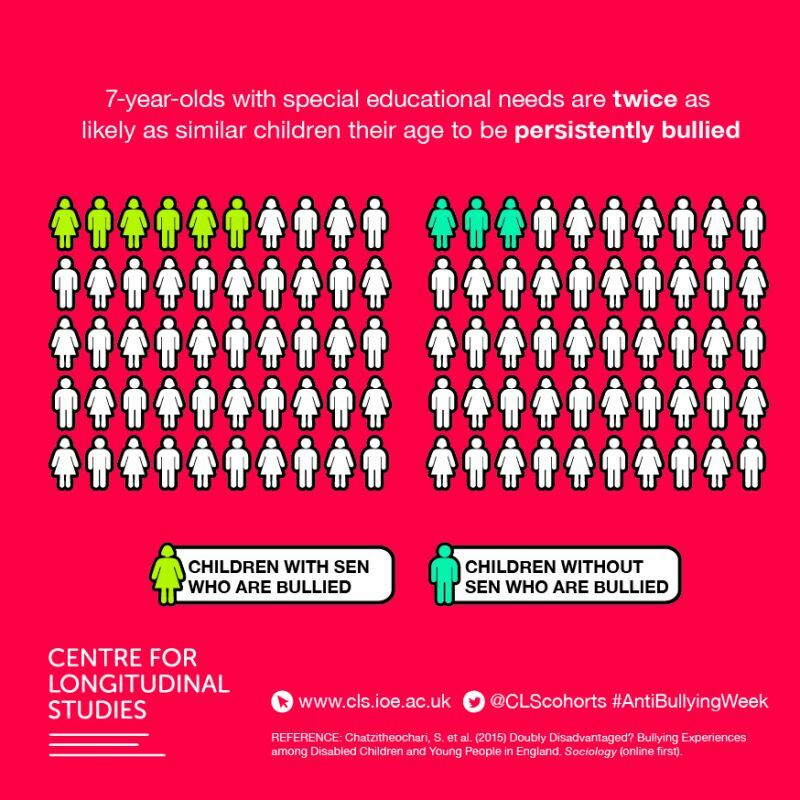 The graphic uses data from Next Steps and was produced as part of the CLS activities for 2015 Anti-Bullying Week. On 9 November 2015, CLS partnered with the Anti-Bullying Alliance to deliver a seminar for anti-bullying charities and local government workers on the long-term effects of bullying. 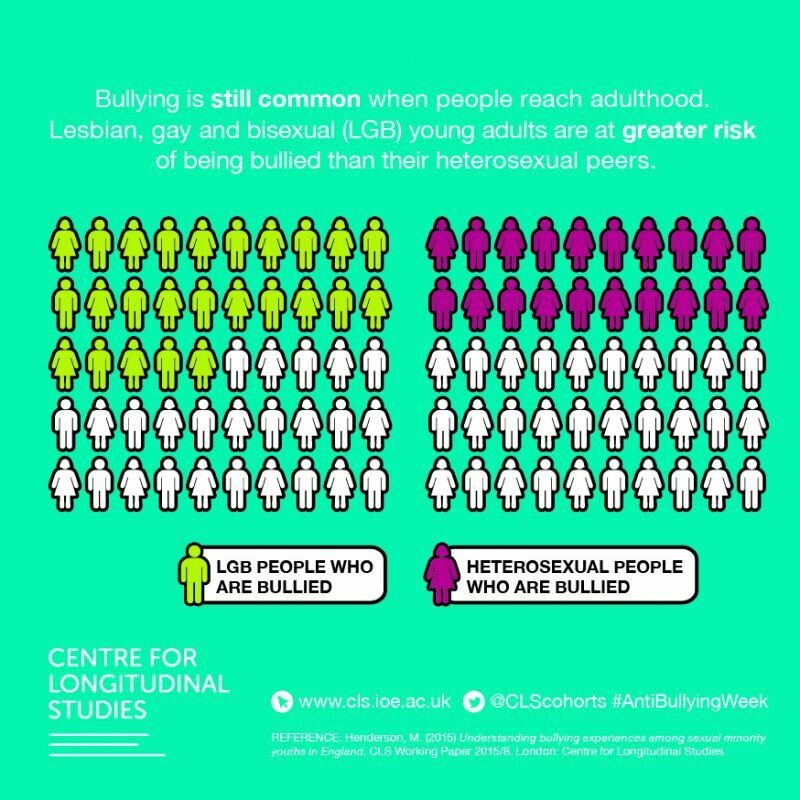 This briefing paper uses data from Next Steps to examine sexual minority groups’ experiences of bullying. It explores the relationship between sexual identities and bullying, including how frequently lesbian, gay and bisexual (LGB) people are bullied, the types of bullying they experience, and how this relates to their life satisfaction. In this series of podcasts, listen to the authors discuss their initial findings from the MCS at age 11.